Miguel Facusse Barjúm was the creator of a world of opportunities for thousands of families in the Central American region, who more than employment, gave additional benefits such as life insurance and private doctor, education scholarships, retirement funds in dollars, and cooperatives. In July 1960, he founded Dinant Chemical of Central America, nowadays Dinant Corporation S.A. of C.V., company which contributed to all the areas of development in the Central American and Caribbean regions. In his birthplace, Honduras, he participated actively to reintegrate the country into constitutional progress, and in the region, for integration in Central America; he was an ad honorem advisor for various Presidents of the Republic of Honduras, and from his position as governor of important guild and business associations, he encouraged the small and medium entrepreneurs. 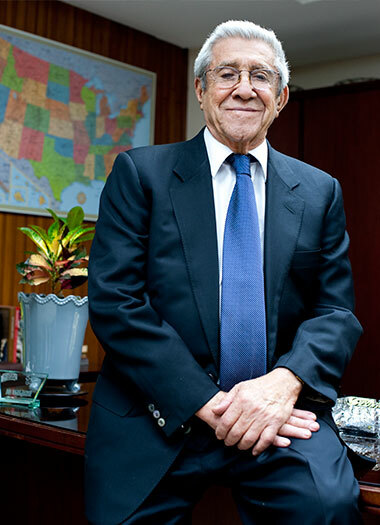 Miguel Facusse’s career is tied to agriculture, to industry, and to Honduras’s return to democratic processes, among others, which made him deserve numerous awards such as: Most Distinguished Industrialist, FECAICA; Distinguished Entrepreneur, Chamber of Commerce and Industries of Comayagua; Boris Goldstein Award to Outstanding Entrepreneur; Distinguished Entrepreneur, COHE; Gold Medal, for his contribution to encouraging higher education reforms, Universidad Nacional Autónoma de Honduras (UNAH); Medal for Distinguished Central American, for his contributions in favor of Central American Integration, Secretary of Economic Central American Integration (SIECA); Honor Condecoration in the rank: Great Cross Golden Plate, by the Republic of Honduras’s Congress; Order: Merit to Democracy in the Rank of Great Gentleman, by the Republic of Colombia’s Second Institutional Permanent Commission, and Honoris Causa Doctor in Politology and High Management, by Colombia’s Academic Corporation Ideas, amongst others. Miguel Facusse was a pioneer, a man with unbreakable spirit, a creator of companies and products that, more than half a century ago, were just a dream, and that nowadays have allowed to view the Honduran entrepreneurial spirit from a new optic, a visionary man, who contributed to the economies of countries where they operate through his business, and where he will be immortalized as an employment generator at a regional level, constituting a pride for all Hondurans and citizens of the region. Honduran folk will remember him for his tireless work in Honduras’s placement at a global scene, through his passion for elaborating quality products, which are innovative and which will ease household tasks, with brands such as Yummies, Issima, Zixx, and Mazola, the latter being an acquisition for Central America and Panama. Miguel Facusse was passionate in his motion towards the search of solutions or alternatives for the improvement of his collaborator’s life quality, and also of persons with lesser economic possibilities, through projects and programs oriented to the protection of youngsters, single mothers, elderly persons, education, health, and environment, among others. Miguel Facusse leaves behind a legacy of love towards his family, and the one which he adopted as his, the Dinant family, a company to which he devoted himself with love, effort, and dedication, leaving an unforgettable trademark, whose fingerprint will remain forever in the heart of all who shared his long career in Honduras and the whole world, where he will forever live as an entrepreneurial man, emotive, driven by his dreams of prosperity, enthused by the transformations that work does, the discipline, the consistency, and the honor; an aware man who checked the world’s pulse every morning and felt before his eyes a never ending parade of opportunities for him and for his homeland.